In the past few years, despite the difficult prevailing conditions, there has been a paradigm shift in how international humanitarian law (IHL) has been taught and disseminated in the Gaza Strip. During this period there has been a twelve-year closure that has affected all aspects of civilian life. Alongside this, the Gaza Strip has witnessed three large-scale military operations that killed hundreds of Gazans and destroyed numerous civilian objects. These conditions could have easily shaken the confidence of Palestinians in this body of law and therefore hindered efforts to teach IHL. However, we have seen the complete opposite happen. Instead of losing their faith in IHL and becoming extremists about the effectiveness of this body of law, its mechanisms and its means of implementation, university students have become passionate and curious about IHL. This shift has not been a lucky coincidence, as some may think. Rather, this change has been able to occur as a result of the significant efforts and contributions by various academic institutions, Palestinian NGOs and the International Committee of the Red Cross (ICRC). How has this qualitative shift in teaching IHL in the Gaza Strip occurred? I believe it is a multi-faceted recipe. First, IHL moved from being a simple subject in university courses, to an area of focus, and then a full program at the bachelor level. Also, the number of students interested in studying IHL has increased significantly. For example, a few years ago, there were barely 15 students enrolled in the IHL field at the University of Palestine in Gaza, but by the beginning of the current academic year 2018/2019, 49 students had voluntarily chosen the field of study. The spearhead has been the self-motivation of university students in the Gaza Strip. In their view, the study of IHL goes beyond just passing exams and getting degrees, it is a lifestyle centered on their desire for a secure and stable life. ‘After this wonderful experience, I realized that there are laws which have been created over the ages to protect humanity from the evils of war, and today I know how I can contribute to support victims to their right to international legal fairness’, said a student to me at a graduation ceremony last year. Another student reflected on her experience with IHL, ‘How frightening the sound of rockets and missiles in the Gaza Strip is, accompanied by painful nightmares. It would have been possible to avoid them if the parties had committed themselves to applying international humanitarian law. I want to study it so that no one would have to experience the horrors of war like I did’. The fertile environment provided by Palestinian universities in Gaza, has created a space for these self-motivated students to grow. The universities have developed academic curricula and opened new horizons by offering innovative ways of studying and touching upon current issues, rather than sticking to traditional learning approaches. They have adopted engaging and participatory teaching methods which go beyond stereotypical teaching and have given students an important role in the teaching process. Students have changed from mere recipients of information into participants who actively analyze, discuss and train, thereby gaining skills and experience. Many students observed their classmates participating in moot court competitions, training courses and research competitions, organized by universities in cooperation with the ICRC and other international and non-governmental organizations. Upon seeing this, they too became eager to travel, win competitions and gain knowledge and recognition at a professional level. To that end, graduate as well as undergraduate students sought to take the journey of studying IHL and international human rights law (IHRL). In fact, most students enrolled in MA programs in public law chose to write their research papers on topics of IHL. Moreover, former students have achieved rewarding results in this field. Most of those who graduated with degrees in IHL at the University of Palestine, for example, found employment opportunities with international and non-international organizations operating in the Gaza Strip. Some of them even have become well-known professionals in training and capacity building, despite the extremely high unemployment rates among Palestinian law professionals. These success stories of former students have played a significant role in motivating new students to study IHL. 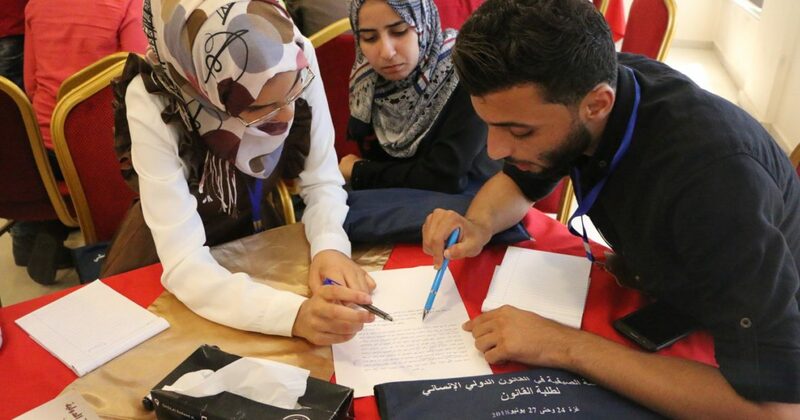 Furthermore, the attention of Palestinian and Arab media—official and unofficial, written, visual and audio—hosting human rights activists and lawyers who recognize the value of IHL, has served as a driving force for Palestinian students in the Gaza Strip. Media appearances, though risky, satisfy personal desire to be under the spotlight. Taking success as a starting point, it is imperative to think about further development. The urgency behind the positive developments in teaching IHL in the Gaza Strip requires specialists in Palestinian universities, as well as local and international partners and local authorities, to seriously consider ways of investing in this qualitative shift. It is important to continue to ensure that new horizons are opened for IHL students. It is necessary find ways to update the theoretical and practical references used in teaching in order to respond to developments in IHL. It is also important to provide training manuals for both teachers and students to demonstrate modern teaching tools and methods, both theoretical and practical. Furthermore, it is essential to create an integrated educational system which conveys to students the theoretical knowledge as well as practical skills inherent in best IHL practices, thus enhancing opportunities for students to engage in humanitarian legal work. And finally, it is important to seriously reflect on future prospects for students. In addition, it is necessary to promote the employment of modern technology in teaching IHL, ensuring that practical tools are available that can contribute to increasing the student knowledge. In this regard, I suggest developing a smart-phone application or a specialized website for teaching IHL which could serve as a platform for systematic compilation of electronic references and other practices. Finally, we also hope that the teaching of IHL can continue to expand. We envision that Palestinian universities will be able to have special programs at the master’s and doctorate levels. This, of course, requires strengthening the role of official bodies, especially the Palestinian Ministry of Education, and semi-official bodies, in particular the Palestinian National Committee for International Humanitarian Law.